This and its corresponding metals are the biggest addition to New Frontier Craft right now. In vanilla Beta 1.7.3, there were 6 ores you could find in the stone. In modern, that is now 7 with emeralds. 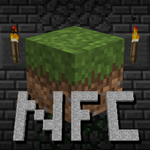 In New Frontier Craft, there are 30. Below are the ores listed by commonality. Some of the details given below are not exact numbers but a way to compare these ores to each other in the grand scheme of things. For exact numbers, click on the ore.
Small to medium clouds with low concentration. Any height below 75, but heavily concentrated in upper caves. Just as it's always been: small veins. In upper and lower caves, but not near bedrock. Large veins that spawn in sets of two. Can be found in lower areas of upper caves and below. Heavily concentrated in lower caves, but can go to bedrock. Common Medium clouds with average concentration. Boron Average Small, unconcentrated clouds. Can be found in very low areas of upper caves and below. Silver Average A bunch of small veins generated near each other. Nickel Uncommon Medium-small clouds with high concentration. Rarely found in low upper caves and at bedrock; prefers to generate in high lower caves. Only found at or a few blocks above bedrock. Massive clouds with average concentration. Very rarely found in upper caves, greatly prefers lower caves and below. Extremely concentrated small clouds, almost veins. Gold Rare Large but spacious unconcentrated clouds. A little above ocean level and below. Halfway down from ocean level and below. Titanium Rare Highly concentrated cloud. Anthracite Very Rare Medium-small veins that generate in sets of three. Underground ponds, rarely appear at the surface. Generates at lower-cave levels, but tends to avoid intersecting with caves. Osmium Rarest Medium-small veins. Low lower caves and below.